Hopefully Barclays is not going to be too upset with this posting. This is one of the results of their latest survey of institutional clients on how the markets will react to the US presidential election outcome. 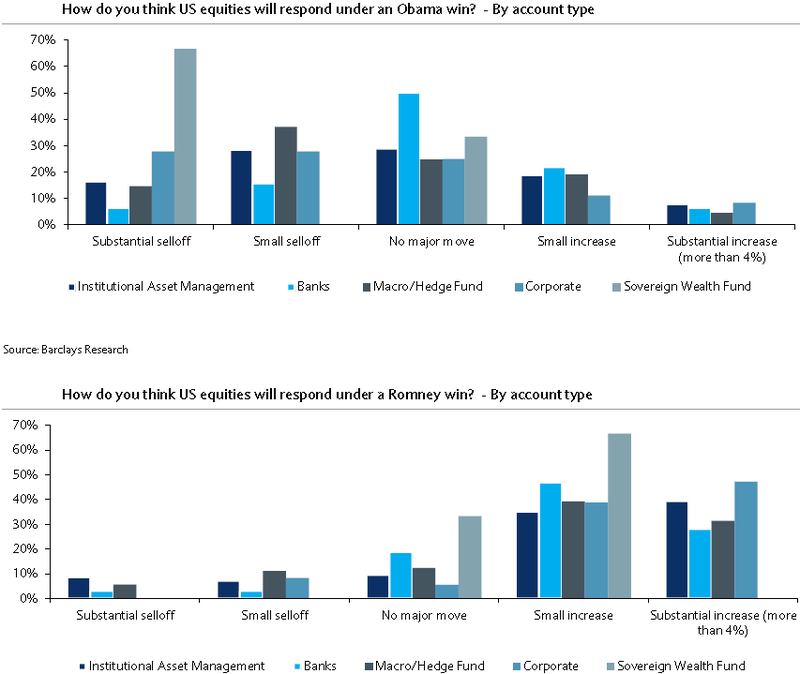 It seems that participants were somewhat bearish on equities if Obama is reelected and bullish should Romney win. What's interesting is that sovereign wealth funds - basically foreigners - feel strongly that there will be a selloff if Obama is reelected. US banks on the other hand are on average neutral. But all agree that there will be a rally should Romney win the election. That's somewhat surprising given that Romney will be more proactive in cutting government programs - which is a negative for many blue chip stocks who view Uncle Sam as their key customer (see discussion). Maybe this is driven by expectations that Romney will ease on regulation or invest more in defense, helping some firms in the process. Thoughts? Comments?